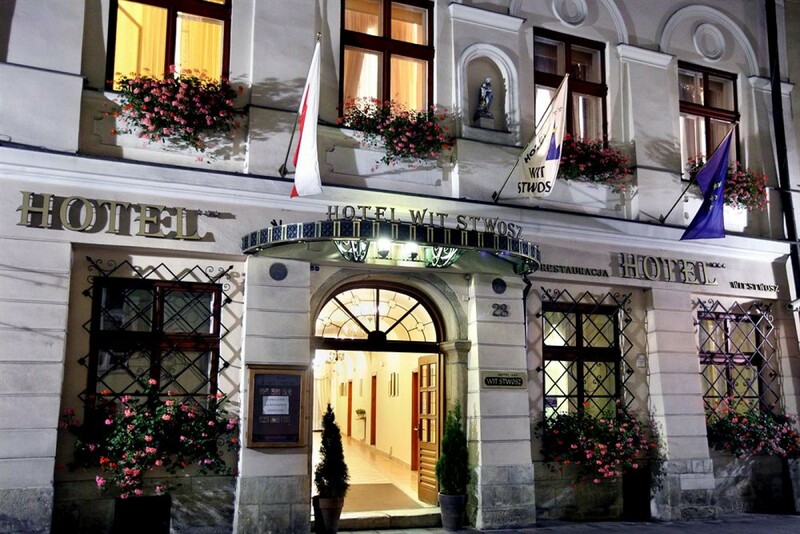 Wit Stwosz Hotel Managment will appreciate your cooperation in respecting the rules which are to ensure that your stay will be peaceful and secure. 1. Hotel rooms are let on a daily basic. Check-in time is at 2:00 p.m., check-out time until 12:00. 2. Should a guest not define his length of stay when letting a room, it is assumed that the room is let for one day. 1. A hotel guest should notify the reception before 10 a.m. on the day the time of letting expires that he wishes to extend his stay beyond the period indicated at check-in time. 2. Such requests are subject to space and availability. 1. A hotel guest may not transfer a room to other persons even should the term for which he paid the due sum have not expired. 2. Persons who have not checked into the hotel may stay in a hotel room between 7 a.m. and 10 p.m. After that time, this person has to be cheked-in and pay additionaly for their stay. 3. A person may be refused acceptance should be have flagrantly infringed hotel rules during a previous stay in the hotel by causing damage to the property of the hotel or other guests, or by should he have the disturbed the peaceful stay of guests in the hotel or the functioning. 1. The hotel renders services according to the category and standard it has been awarded. Should a guest wish to complain about service quality he is requested to notify such complaints to the reception staff at the earliest possible moment to allow the hotel to react rapidly. 5) technically efficient servicing; should faults appear which cannot be remedied, the hotel will spare no effort to change the room or to alleviate the discomfort caused. On request the hotel renders the following services free of charge: to provide information related to the stay or travel, to arrange wake up call, storage the luggage (hotel may refuse to storage the luggage if it is not during the stay of guest of if the luggage is not a personal stuff), according to standard law. 1. The hotel accepts responsibility the loss of damage to articles brought by person using the hotel's services to the extent defined in the provisions in art. 846-849 of the Civil Codes unless the parties decide otherwise. 2. A hotel guest should inform the hotel reception immediately after they have remarked that damage has occurred. 3. Hotel is not responsible for loss, damage or theft of cash, jewelery or other valuables if not left in safe deposit box at the reception desk. The hotel's responsibility for loss or damage to monies, securities, valuables or objects of scientific or artistic value is limited. In case of loss or damage to above mentioned articles, compensation may not exceed the amount set by the previous of the regulation of the Minister of the 14 November 1994 on limiting the responsibility of persons managing hotels or similar objects as a source of earnings (Dz. U. of 1965 No. 1, item 2, with later amendments). 1. Curfew in hotel is obligatory from 10 p. m. to 7 a. m. the following day. 2. The behavior of guests and other persons making avail of the hotel's services should not disturb the peaceful stay of other guests. The hotel may refuse to render any further services to a person who infringes that principle. 1. Whenever as guest leaves his room he should check that is locked and leave the key with the reception staff. The reception staff delivers the key on the hotel's check-in card. 2. A hotel guest is responsible materially far all and any damage to or destruction of items of the hotel's equipment and technical devices which he may cause or which are caused by person visiting him. 3. For reasons of fire safety, the use of electronic heaters, flat irons and similar item which are not items of room equipment is forbidden. 4. Smoking is prohibited in the Hotel. All rooms are not smoking. Penalty charge for smoking in the room is 500 PLN. Articles of persons property which may be left in the hotel room bt a departing guest will be sent to the address given by the guest. Should such instructions not have been left, the hotel will store objects for period of 3 months. All the meetings or Conferences shall be oranized in hotel's meeting rooms or Conference hall, according to their own rent – terms.